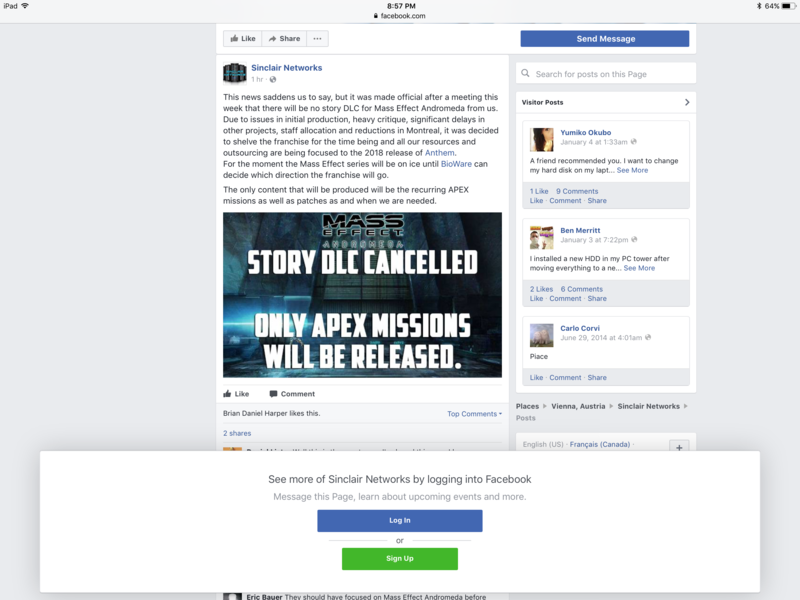 The rumours surfaced in the form of a Facebook post from a company called Sinclair Networks, which claimed that "story DLC" for Andromeda had been ruled out due to, "issues in initial production, heavy critique, significant delays in other projects, staff allocation and reductions in [Bioware] Montreal." These claims echo the details of a report published by Kotaku in May, in which numerous sources said that the Mass Effect franchise had been shelved and a significant chunk of Bioware Montreal's staff moved on to other EA projects - including Battlefront 2, a new Dragon Age, and Bioware Edmonton's new IP, Anthem - following Andromeda's technical issues and mixed critical response. However, several Bioware staff have declared the post a hoax, with producer Fernando Melo wryly observing on Twitter that, "we build our own dlc/patches for our games and don't hire fake companies to do so." The internet is what it is. Doesn't change the fact that there are things we can & cannot talk about at times, as part of a public company. EA also issued a statement confirming Sinclair Networks as a hoax, but neither it nor Bioware's employees would comment on whether Mass Effect would depart from the series' tradition of single-player DLC. Indeed, in response to the May report, Bioware Montreal studio director Yanick Roy said that the studio would continue "to focus on the Mass Effect Andromeda community and live service," with no mention of plans for story DLC. Now, Kotaku has confirmed with three separate sources that, while Sinclair Networks was a hoax, the information was accurate. "There are few people left at BioWare Montreal who could even work on it," the article stated, adding that it would require "some sort of drastic pivot" for Andromeda's players to receive story DLC now. Bioware did not respond to multiple requests for comment. While Andromeda didn't win over as many fans as the previous three games, this turn of events will be disappointing to many. Mass Effect 2's Lair of the Shadow Broker and Mass Effect 3's Citadel are among the finest examples of story DLC for any game, and both were just one part in a series of DLC releases. At E3, Bioware's new IP was revealed to be Anthem, an online action game being developed by the main studio in Edmonton.